It all started way back in 1959 when I cycled the seven miles to Arnside to enquire about the boatbuilding apprenticeship advertised in the local paper. I was accepted and so started my future career working with wood. Back in those days, much to my father's dismay, boatbuilding was just another trade but I loved the work. To me, a boat was not only a functional object built to fulfil a purpose, it was also a thing of beauty, combining a host of different materials with a multitude of complex curves to produce a purposeful vessel that was a splendid work of art and completely at home in its natural environment. Art, woodwork, metalwork and science were the four subjects I excelled in at school and have all featured strongly throughout my working life, allowing me to lead a life often rich in experience and adventure, but financially invariably close to disaster. My interest in art came to the fore when I decided to open a small art gallery. The gallery stocked work by local artists and an ever-increasing amount of my own simple woodturnings. Around eight years ago I replaced my Myford ML8 lathe with a new Nova 3000. The purchase of several new tools and a couple of new chucks, followed three days of tuition with Jimmy Clewes, thus greatly extending my woodturning horizons. 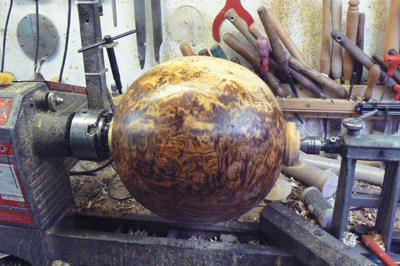 A trip to Northern Italy with the local Community Woodland Company allowed me to meet Ernst Gamperl at his studio workshop during one of his annual open studio events, which was a fantastic experience. To say that I was impressed with his work was an understatement. It was truly phenomenal and epitomised everything that I was working towards, but hadn't yet identified. I have met Ernst a couple of times since then and I am indebted to him for the inspiration he has given me. 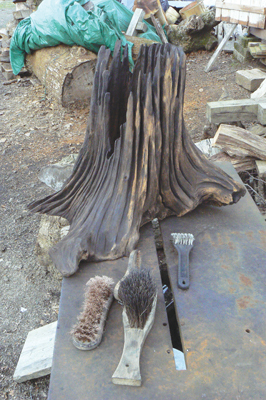 The piece required a well rotted oak (Quercus robur) stump with a partial root plate as the base for the sculpture. Early last year I found a suitable piece which was taken back to the workshop, pressure washed and put aside to dry. I found another old log that would make the upright element of the piece which I was able to retrieve a few weeks later, once the ground had dried out. 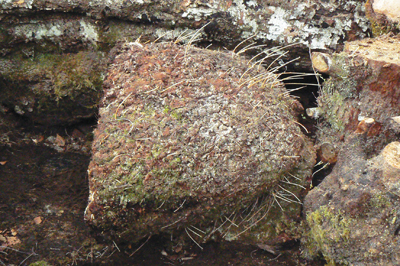 I love the effect our wet local climate and the natural conditions of the forest floor have on a fallen oak tree stump. Insect and fungal attack had taken their toll on the sapwood and were starting to make inroads into the heartwood, wherever there was a weakness in the grain. As long as the rot has not gone too far, I am able to pressure-wash off the moss and debris, to reveal the wonderfully sculpted surface with which I can then work. 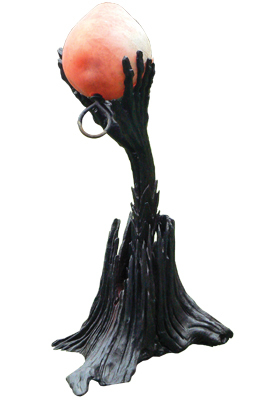 I'm able to carve and accentuate this to create an organic flowing form that is the essence of my work. One of the problems was how to connect the poles to the globe. As this was turned wet, it would be constantly changing shape as it dried out over a considerable length of time, so fixing the poles to it was not an option. 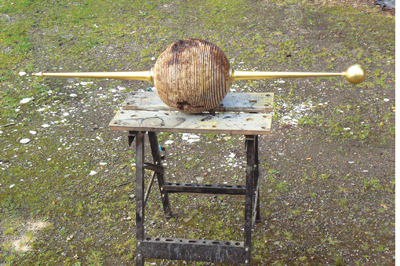 A 600mm length of 12mm threaded rod glued into one pole and a captive nut in the other meant that the two poles were independent from the globe. 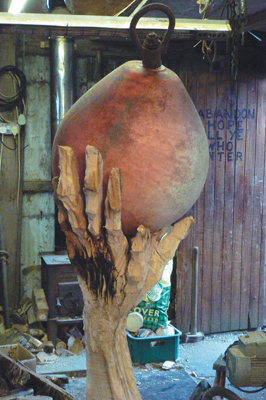 This would maintain perfect alignment and could be adjusted as the globe shrank.My client had requested a sculpture somewhat lower than 'Genesis', a previous piece I had made, so I had constructed the base accordingly. When I had finished all the parts and put the globe with its poles in place, it didn't quite have the impact that I had hoped for. I solved this by making a 450mm high x 600mm x 600mm plywood plinth, on which it now stands, giving an overall height of 2,070mm. 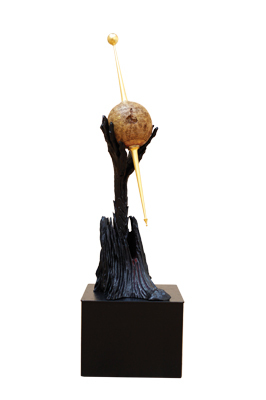 This also gives the option of standing it at floor level, if needed.The world in this sculpture, 'The Conception of Polarity' is represented by a oak burr globe. I decided to turn this from wet wood and incised the surface with deep parallel cuts to allow the surface to move as it dries out. Over a period of time the stresses within the wood will be released to contort the ribs and develop a fascinating random structure, representing the folds in the rock that make up the world's surface. Quite the opposite to the rest of the work and deliberately very organic, I have made the north and south poles on the sculpture very precise and richly covered in 23ct. gold leaf, in order to reflect the importance and permanence of the earth's magnetic field. Without this we would not exist. 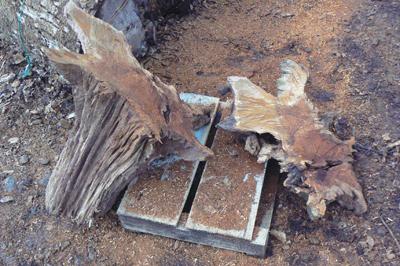 The first stage was to prepare the oak stump and root plate. I also collected another old oak log that had a nice curve and a fork at the upper end which was perfect for the upright section. I used a chainsaw and adzes to rough out the general shape and an Arbortech and Proxxon mini-carver created the finer details. 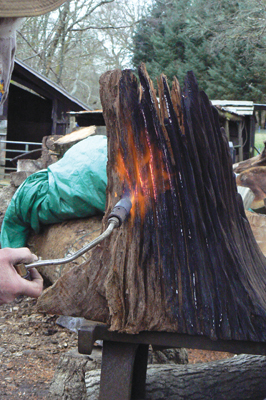 Once the base section was hollowed and carved, it was then scorched with a gas blowtorch before being wire brushed. A socket was made in the base to take the upright section. 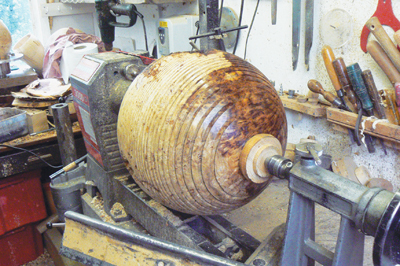 For the globe, I used a 300mm diameter mooring buoy as a template. The hands were trimmed to fit, scorched and wire brushed. It was then glued into the base and the whole piece stained with Liberon ebony water-based palette wood dye followed by a couple of coats of Polyvine wax finish varnish. 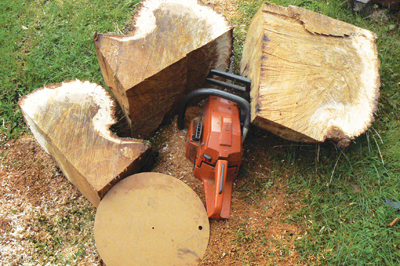 A green oak burr was perfect for my requirements so I cut it to size with a chainsaw using a 350mm disc as a template. The burr, weighing about 65lb was then mounted between centres. Using a 300mm semi-circular concave template, I turned a perfect sphere which included some of the bark from the oak burr. A 65mm socket was turned at each end to take the Nova chuck jaws in expansion mode.The globe, now a little under 60lb was pushing the chuck jaws to the limit and it did fall off the chuck once. 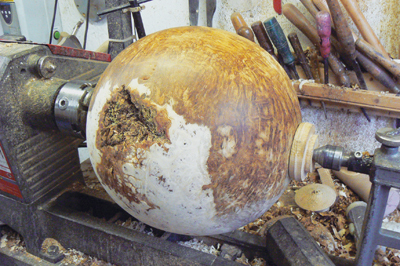 A very slow speed and a lot of care enabled me to hollow out over half the sphere from one end, through the chucking socket. It was then turned and hollowed from the other end. 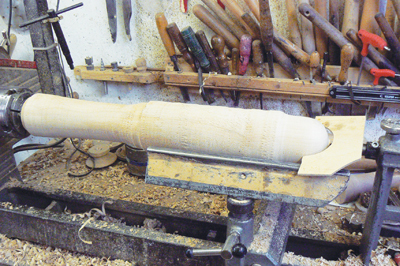 I then used a Rolly Munro hollowing tool, with regular stops to vacuum out the shavings that had accumulated. The walls were now about 25mm thick all round, considerably reducing the weight of the piece. Plugs were turned to fit into the sockets to take the jaws, tailstock and live centre. The surface was then trued and cut with parallel slots about 13mm deep, using a thin parting tool. To slow the drying of the surface I melted in a lot of beeswax, using a hot air gun. 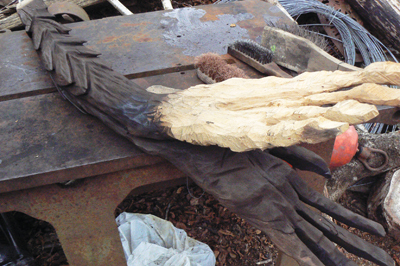 I have used this well-proven method for many years and it works extremely well on wet wood. I made the poles from well seasoned sycamore (Acer pseudoplatanus) and used a 100mm diameter concave template to turn the perfect sphere on the end of one pole. 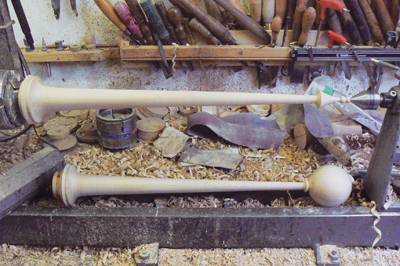 The rest of the 600mm long poles were turned freehand. One end of each pole is drilled with a 12mm hole about 150mm deep, to take a length of 12mm threaded rod. One end of this then had to be glued into a pole and a 12mm nut was epoxy bonded into a recess in the other pole. The base end of each pole was turned to fit the socket on either end of the globe and the rod keeps each pole in alignment, thus enabling the poles to be drawn together as the globe shrinks. 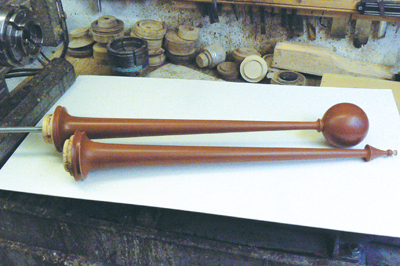 The next stage was for the poles to be sanded down to 600 grit before being given four coats of Fontenay base. 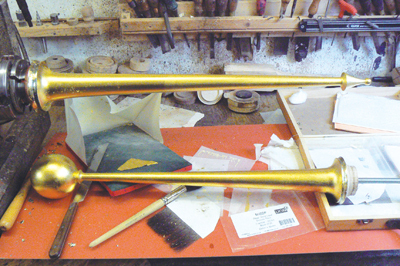 They were then rubbed down again from 600 to 1,000 grit, prior to gilding with 23ct. gold leaf. They were then left to harden for a couple of days. Finally, here are the globe ends of the poles with the threaded rod in place. 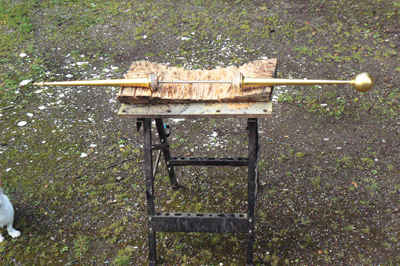 The newly gilded poles were then left to harden for a couple of days. The next step was to screw the poles together. The globe was then added and the poles were placed. The surface detail of the globe will continue to develop for some time to come. The globe and poles were then added to the rest of the sculpture, which was then complete.